While on the exam, you will not be required to mathematically calculate the amount of energy a given electron has, you should be able to qualitatively apply Coulomb’s Law. Essentially, the greater the charge of the nucleus, the more energy an electron will have (as all electrons have the same amount of charge). Coulombic potential energy is considered to be 0 at a distance of infinity. The Coulombic potential energy for a 1s electron is lower (more negative) than that of say, a 3s electron. The amount of energy required to remove a 1s electron, thereby bringing its Coulombic potential energy to zero, will thus be greater than the amount needed to remove a 3s electron. This removal energy is called the binding energy of the electron and is always a positive value. Max Planck figured out that electromagnetic energy is quantized. That is, for a given frequency of radiation (or light), all possible energies are multiples of a certain unit of energy, called a quantum (mathematically, that’s E = hv). So, energy changes do not occur smoothly but rather in small but specific steps. Neils Bohr took the quantum theory and used it to predict that electrons orbit the nucleus at specific, fixed radii, like planets orbiting the Sun. Each energy level is represent by a row on the periodic table. There are currently seven known energy levels, which correspond with n = 1 to n = 7. 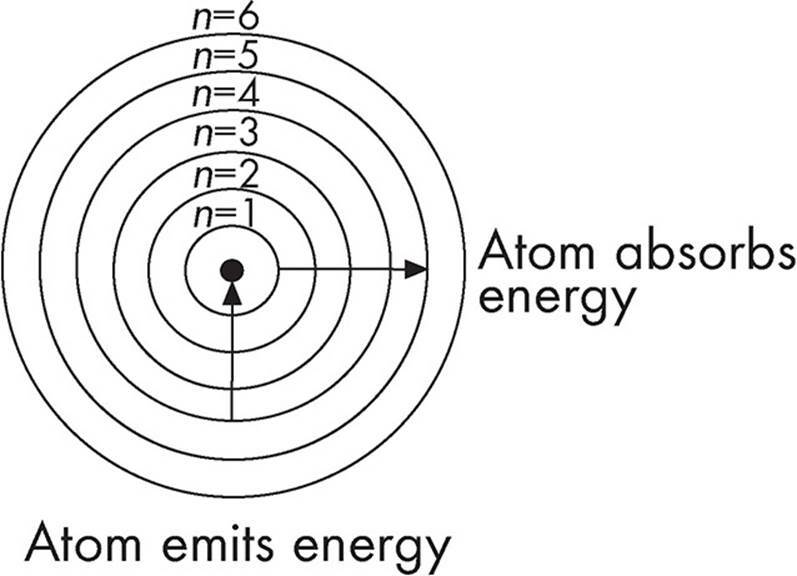 The closer an energy level is to an atom, the less energy electrons on that level have. While the Bohr model is not a perfect model of the atom, it serves as an excellent basis to understand atomic structure. When atoms absorb energy in the form of electromagnetic radiation, electrons jump to higher energy levels. When electrons drop from higher to lower energy levels, atoms give off energy in the form of electromagnetic radiation. The relationship between the change in energy level of an electron and the electromagnetic radiation absorbed or emitted is given below. For a particular atom, the energy level changes of the electrons are always the same, so atoms can be identified by their emission and absorption spectra. The frequency and wavelength of electromagnetic radiation are inversely proportional. Combined with the energy and electromagnetic radiation equation, we can see that higher frequencies and shorter wavelengths lead to more energy.